A flag at half-staff honors fallen political leaders, military heroes and victims of national tragedies. 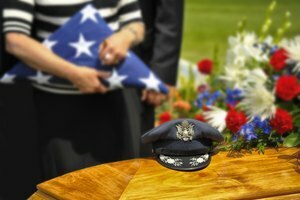 The U.S. flag is a deeply meaningful symbol of the nation, and plays a role in national holidays, public funerals, military displays and response to national tragedies. The Flag Code, which dates from 1924, outlines the formal etiquette for the U.S. flag for civilians; it is not law, so legal penalties do not result from failure to observe its guidelines. 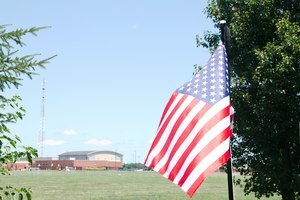 The federal government issues laws that govern flag use at U.S. government facilities, such as post offices, after the deaths of public figures. 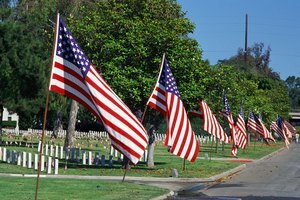 The term “half-staff” means the flag flies from halfway up the flagpole, not its usual position at the top. 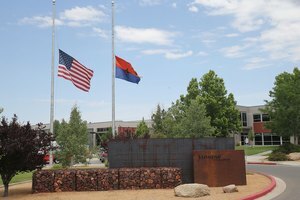 The National Flag Foundation outlines special steps for achieving proper half-staff display. 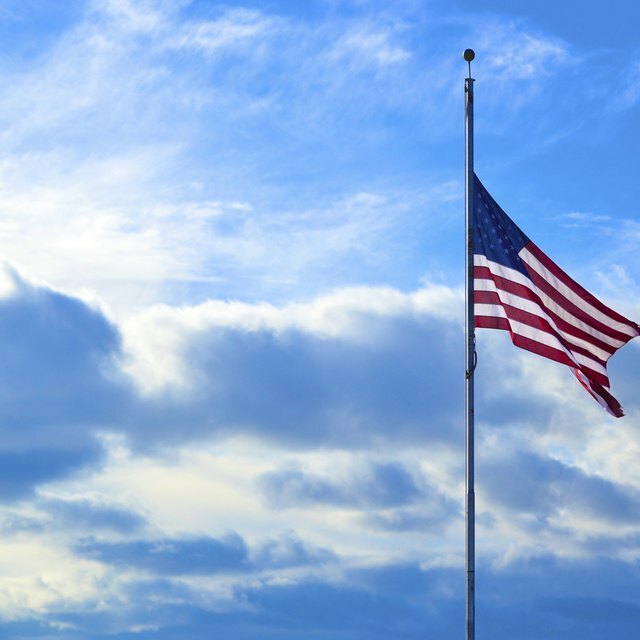 To fly a flag at half-staff, first raise it to the top of the flagpole, then lower it halfway; before lowering the flag at night, again raise it to its highest position, then lower it. Flying a flag at half-staff honors the dead, but raising it fully at the beginning and end of the day honors the flag itself. The half-staff protocol demonstrates respect for government officials, present or former, who have died. The U.S. Code specifies that this honor is accorded to “principal figures of the United States Government”; it may also be accorded to state or territorial officials, at the discretion of the governor of the state or territory. The mayor of the District of Columbia has the same authority to call for half-staff flag displays in his jurisdiction as do state governors. The flag flies at half-staff for 30 days after the death of a president and 10 days for the death of a vice president, Speaker of the House or Chief Justice of the Supreme Court; for most other officials, including governors and associate justices of the Supreme Court, the flag flies at half-staff between the day of death and the internment. When the death to be honored is not an American official but a foreign leader, diplomat or other dignitary, U.S. flags may still honor the occasion. In these cases, however, the president must specifically authorize a half-staff display; such displays may also be called for informally, as long as they do not conflict with existing law. 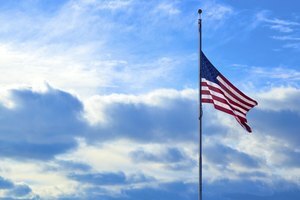 This honor falls to the president’s discretion; flags were not officially flown at half-staff for the 2013 death of former U.K. Prime Minister Margaret Thatcher, for instance, although the president did issue a formal statement of mourning. The flag was flown at half-staff after the 2005 death of Pope John Paul II, however. Just as the president can authorize flying the flag at half-staff for foreign dignitaries, he can also authorize it for leading American political figures who did not hold formal office. President George W. Bush extended this honor to civil rights leaders Rosa Parks, in 2005, and Coretta Scott King, in 2006. 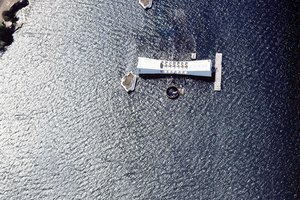 In both cases, the flags were flown at half-staff for a single day, the date of their internment. Spirko, Jennifer. "Flag Etiquette in Regard to Political Deaths." Synonym, https://classroom.synonym.com/flag-etiquette-regard-political-deaths-6162.html. Accessed 25 April 2019.